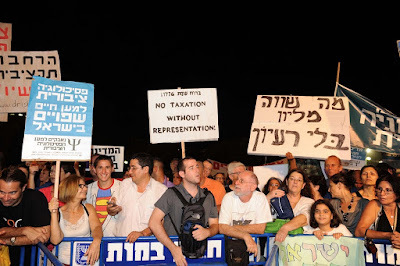 Protests were held in Jerusalem, Tel Aviv, Eilat, Afula, Karmiel, Hod Hasharon and other cities around Israel. In Haifa, a city with large Arab and Jewish populations that live together peacefully, protests focused on coexistence and peace. “A new hope was born this summer. It was a miracle” said another one of the protests’ main organizers, Daphni Leef. Saturday night’s peaceful demonstrations were the climax to an ongoing public debate in Israel about economic and social priorities. The debate has been led by Israel’s middle class and includes issues related to jobs, housing prices, the taxation burden, public welfare and the high-cost of living for average Israeli families. Many young Israelis around the country set up tents as make-shift homes during the past month to symbolize their desire for economic reform. “We are the new Israelis,” said Itzik Shmuli, National Student Union Chairman, to a crowd of some 300,000 Israelis in Kikar Hamedina, an affluent residential neighborhood in northern Tel Aviv. Israel’s Prime Minister Benjamin Netanyahu quickly responded and convened the Trajtenberg Committee to address the distribution of expenses and housing shortages in Israel. The Committee met throughout August to work on ways to lower the cost of living in Israel. It will submit recommendations to the government within two weeks. “My Government is committed to carrying out tangible changes in order to ease the cost-of-living and correct social distortions. I believe that the public dialogue that has developed, as well as the discussions of the Trajtenberg committee, will offer us a unique opportunity to implement genuine and responsible changes in this sphere,” Netanyahu said at the start of his weekly cabinet meeting today. “Israel has never had a committee that has begun such an open and serious dialogue with thousands of citizens…I intend to act quickly, pursuant to its recommendations, and maintain the correct balance between social sensitivity and responsible economics,” added Netanyahu. The High Court of Justice ensured on Friday that trains that were set for maintenance work would remain open so that citizens from all over the country could get to Tel Aviv for the protest. In Tel Aviv, police and security guards stood calmly as the crowds rallied. They were deployed to ensure public safety. MDA, Israel’s emergency rescue service, was also on-hand and helped evacuate a few people who fainted.